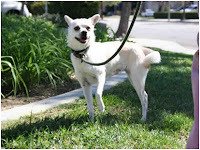 Hearts to the Rescue: L.A., CA shelter - now 114 days & counting, MAPLE is STILL at the shelter needing rescue! L.A., CA shelter - now 114 days & counting, MAPLE is STILL at the shelter needing rescue! WHO AM I? My name is Maple. I'm not sure why I'm still here because I love people and other animals. I promise to be a great dog and will give you so much love. From: ani newhopewv: "Sweet shy Maple, a 3 year old chihuahua that has been at West Valley since november needs a loving home or foster home. She came in as a owner surrender because the other dog in the home did not like her. She can be bossy sometimes depending on who her roomie is but she loves walks, great on a leash and is now a student in the nosework program. 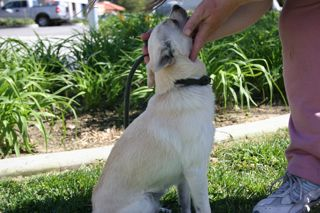 She has been over looked at West Valley and waits patiently for her chance to get a loving forever home. If you can help lil Maple please call us asap!! Please no long term boarding or transporting to other states for this gal. She deserves to go right to a loving home!!" 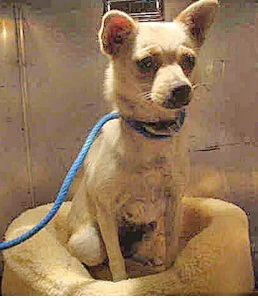 MAPLE - ID#A1249022; smooth coated white chihuahua, 5 y/o, 13 lbs; spayed; at shelter since nov 10, 2011.